L'Union européenne a besoin d'une approche audacieuse, imaginative et réalisable pour surmonter les divisions et gérer efficacement les mouvements de réfugiés conformément au droit international. Cette contribution du Haut Commissariat des Nations Unies pour les Réfugiés (UNHCR) fournit une vision sur la manière dont cet objectif pourrait être atteint dans l'Union européenne et dans le monde. The last year was exceptional in Europe, as over one million refugees and migrants undertook dangerous journeys across the Mediterranean Sea in search of safety. Despite indicators that the numbers of people arriving were increasing, the extent to which they escalated caught many countries in Europe unprepared, and chaos prevailed. The capacity of EU Member States and the Common European Asylum System (CEAS) was severely tested. Some countries, such as Austria, Germany, Greece, Italy, and Sweden, were more affected than others. Fragmented responses emerged amongst EU Member States. Some took measures to restrict access of refugees and migrants to their territories and to shift the responsibility to neighbouring countries. Although several made efforts to welcome refugees, the lack of a common EU response led to seemingly intractable policy dilemmas. This resulted in serious operational difficulties, exacerbating the already precarious circumstances under which refugees and migrants arrived in the EU. Globally, for the last couple of years, the number of people forced to flee their homes has been on the rise, including from countries in Europe’s neighbourhood. Finding political solutions to the conflicts that drive people to flee remains critical,and Europe needs to be more engaged in these efforts. In addition, countries receiving the largest numbers of refugees must receive predictable support to protect, assist, and provide solutions for them. In light of this reality, it is important to invest in stabilizing the situation in these countries. At the same time, Europe needs to be prepared to continue receiving refugees on its territory by engaging in contingency planning and putting in place an efficient and better managed asylum system. Expanding safe pathways for refugees to Europe could also provide realistic and meaningful alternatives to human smuggling and irregular movements. World leaders recognized the need for a humane, considered and comprehensive approach to tackling the realities of displacement in their adoption of the New York Declaration on Refugees and Migrants on 19 September 2016. It is timely, then, for the EU to build on this Declaration, and revitalize its engagement, not only among EU Member States, but also with countries of origin, refuge and transit. A principled, pragmatic and common approach to responding to refugees and migrants is possible and achievable within the framework of the EU. 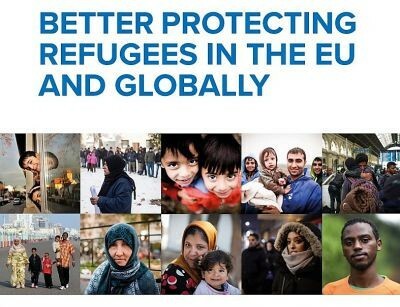 UNHCR, the UN Refugee Agency, sets out in this paper a vision for achieving this through a comprehensive EU asylum and refugee policy of the future, both in its internal and external dimensions. The proposals made here can facilitate the development, over the longer term, of coherent EU-wide arrangements to address and respond to movements effectively. There is strong precedent for this kind of creative and forward thinking in Europe – no more evident than in the formation of the EU itself, which was founded on principles of respect for fundamental rights, responsibility, solidarity and trust.